Winter break after my first semester in college was an odd one. After being whisked away to a strange land full of challenging classes, women, large quantities of bacon, and people from all walks of life, I returned to the suburban home of my father. After some time playing with my first digital camera and discovering the wonder that was a 32MB SD card, I would return to my studies as an engineer at the college I was attending. Shortly after classes started up, a massive snowstorm would rock the eastern seaboard. How massive was the storm? Well, it has its own Wikipedia page, so that’s pretty cool. While snow days are awesome, there’s always a little mystery with a snow storm. Sure, the snow was bad, and we’d have the next day off, but what about the day after? Being the astute individual that I am, I decided to get all my projects and work done so that I wouldn’t get in the vicious cycle of procrastination. After all, the snow fell on a Thursday. Surely we’d be back in school by Monday…right? Nope—we were out until the following Friday. Thankfully, the dining services staff had enough supplies and staff on call to serve the thousands of students trapped on campus. But, without classes and homework, what would everyone do with their free time? Well, it was 2003, so everyone was really in to The Matrix and Lord of the Rings, not to mention all the great early 21st century video games like GTA Vice City, Jedi Knight, Morrowind, and countless others. While network play over the school LAN was possible, we needed something more…epic. Something that would bring everyone together for a memorable snow storm event. But, what to do? My friend and I noticed that some other dorm-mates were playing Halo for XBox on the TV in the lobby. This was a pretty nice setup since there were couches down there, and it drew a pretty decent crowd—but, only four player slots doesn’t give you that much opportunity to play. 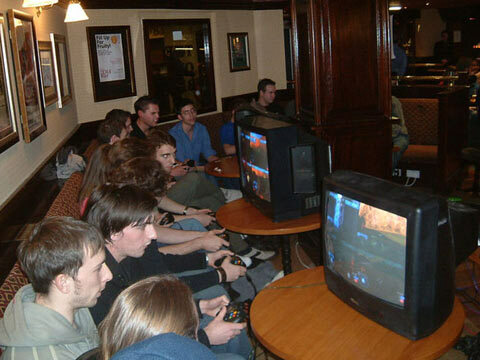 Then, someone realized that if we had enough XBoxes and TVs, we could string them together and have a LAN party. One by one, people started hauling these massive CRT TVs down to the lobby along with XBoxes, network cables, controllers and copies of Halo. So, we hooked everything up and set up the game. I sat down at a controller, despite never playing Halo and being incredibly unfamiliar with the XBox controller. To this day, I can’t stand that they use X, Y, B, and A for the face buttons, but not in the same configuration as the Super Nintendo. Yarrrgh! Not to mention that the last shooter game I played seriously was Goldeneye. But I digress, for the gaming was about to commence. In the actual event, we had some bigger TVs, and didn’t sit quite this close. We battled long into the night. With an incredible energy in the room, we all shouted and carried on as we battled an awesome 16-player brawl. There’s something to be said about a local game match compared to playing with everyone online. The person who got last place on the leaderboard had to take command of the awful Mad Catz controller. You know, the controller that was $5 cheaper but had a horrible feel to it in the thumbsticks and button. So, that was a great incentive to not get in dead last. So, we battled on into the night as we prayed for the snow plows not to come and to have as much time off from class as we could. Of course, the plows came and the snow dissipated, but for me, the memories of that day would never melt. Passing the MadCatz controller… that’s just pure cruelty.